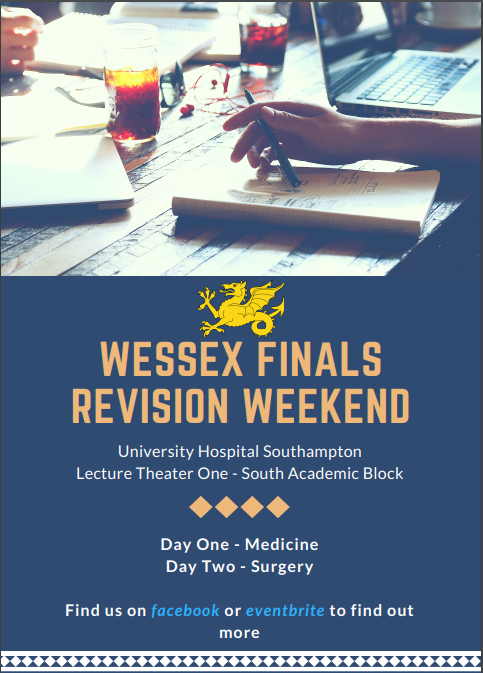 The Wessex Finals Revision Weekend will run on the 17th/18th November. It comprises of a succinct series of revision lectures to cover the most fundamental concepts needed for medical school finals exams. It is being run by a group of high achieving F1 and F2 doctors, some of whom are also part of the academic foundation program and all of whom have passed finals recently. Day 1 (medicine) cardiology, respiratory, paediatrics, renal, endocrine, tips for OSCEs. Day 2 (surgery) general, vascular, orthopaedics and rheumatology, obstetrics and gynaecology, tips for the written papers. The format of the day will be completely lecture based but will address common features of the written, multiple choice and osce exams. There will be many practice osces offered by others and we do not want to duplicate this. The event is free but we are not offering an included lunch.